If you’ve recently made the decision to move to Las Vegas, you may be trying to figure out where to live and whether it’s better to buy or rent the place you will live. Because Las Vegas was hit hard by the housing crisis that precipitated the Great Recession, the prices of many homes are still well below their 2006 and 2007 peaks, making home ownership in Las Vegas affordable even for those just starting out in a new city. On the other hand, the flexibility of renting – especially in an unfamiliar area with a decidedly unique culture – can be hard to beat. How can you decide whether renting or buying is right for you? Read on for some of the factors you’ll want to consider when making your next big move. There are a few important factors that may drive your decision to rent or buy — and surprisingly, none of them are based solely on finances. First is the permanency of your plans. If you’re considering Las Vegas a short stop along your journey, purchasing a home you may be anxious to resell in a year or two when you’ve decided to move on can be more hassle than it’s worth. And even if you plan to stay a long time, jumping into the purchase of a home because it’s close to your current job (or where you’d like to work) without getting to know your neighborhood, or considering your long-term potential at this new employer, could leave you regretting your quick home-buying decision. Where you live can be a big factor in whether you end up happy in your new city. Your day-to-day (and in Vegas, probably your nighttime as well) experience will form your opinion of living in Vegas. When selecting a neighborhood to call home, consider your personal style, your needs and desires for the community in which you live. Do you prefer neighbors who are involved in each others’ lives and think nothing of dropping by to borrow a cup of sugar, or do you naturally gravitate to neighborhoods where busy residents are happy to limit interaction to a polite nod on the sidewalk? Do you like a quiet suburban lifestyle, with lots of space to call your own, or do you prefer dense housing located to lots of action spots, or maybe even highrise living for the lifestyle and great view? The culture of Las Vegas and its combination of glitz and glamour, with a touch of country still left in it, can be an adjustment for newcomers from more traditional communities. The norms and routines of most American communities don’t necessarily apply in this 24/7, anything-goes town. It’s a true melting pot of people from everywhere (yes, there are some people from here), and it attracts people who want to do their own thing, so expect a bit of eccentricity in your daily travels. But Las Vegas has grown a lot, and with maturity, lots of great places to live have cropped up and settled down, even some that you’d swear are nowhere near Las Vegas. From urban Downtown Las Vegas to suburban Summerlin or Henderson, you’ll find lots of different neighborhood styles, some more traditional than others. Testing out a neighborhood by renting before pulling the trigger on a purchase can help you test out the atmosphere and get comfortable before buying in for good. Is renting or buying a home in Las Vegas a better financial decision? If you’re planning to stay in Las Vegas over the long term and think you’ve found your perfect neighborhood, make sure your decision either to buy or rent is a sound financial choice. Buying a home is often seen as a good investment, since part of your mortgage payment goes toward owning the home (that is, you’re paying yourself). Historically, too, home prices rise over time so you get more money out when you sell. But, of course, we all know after the recent mortgage meltdown, that there are downsides as well. Your mortgage payment, which is initially mostly interest paid to a bank, can sometimes cost more than a rental. And there’s no guarantee your home’s value will go up. The general rule of thumb is, if you plan to stay 5 years or more, buying a home is usually a good decision. If you’re not sure, renting is the best way to settle in until your plans are more definite. There will always be great homes to rent or buy in Las Vegas. Different cities have different costs of living, and sometimes that can impact the cost of renting vs. buying. For example, in the San Francisco Bay Area, homes are so expensive, it’s cheaper to rent than buy a property right now. This online calculator from Trulia helps you figure out whether renting or buying is better for you based on a number of factors, including the community you’d like to live in. Are you ready to rent in Las Vegas? 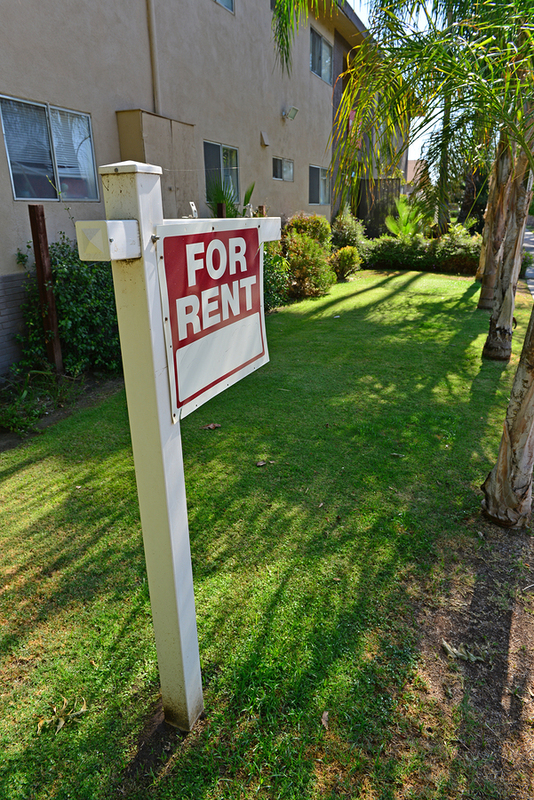 If you get into town and plan to rent until you get settled, be sure you are set to qualify for an apartment. A lot of first-time renters are surprised by what it takes. So, before submitting your first rental application, take a few steps to ensure everything is in order. Discovering an error on your credit report only after your rental application has been denied, or being unprepared to pay an application fee, could leave you without a place to stay or at least cost you that perfect apartment that instead went to someone better-prepared. The names, addresses, and phone numbers of former landlords or other personal references who can vouch for your reliability as a tenant. The apartment or property manager may also perform a criminal background check or even contact non-listed references before deciding whether to extend a lease to you. By being prepared with as many of these items as possible before submitting your application, you’ll impress this decision maker and improve your odds of a quick approval. Need a Las Vegas moving company? Move 4 Less can help! Move 4 Less is ready to help you move wherever you need to go, whether it’s into, around, or out of Las Vegas. We’re locals, founded and located right here in Las Vegas, so we can give you tips and information about neighborhoods, getting services you need, and generally about living in Las Vegas. Give us a call for help with your move, or contact us here for a free quote.